Great Service from the lady who checked us in. Stay here periodically . Great for the price. Live in town but sometimes need a little break from the stress and get away and relax for a night or two without having to travel so makes it a little cheaper of a getaway when you need that time alone to destress and relax. The over all experience was extremely pleasant, I enjoyed the music room, breakfast was plentiful and our inter action with other guests that evening was congenial and interesting. We did not experience the gardens because grounds were still recovering from the winter ! Where to find Morrisburg hotels near an airport? 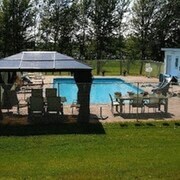 Where can I find hotels in Morrisburg that are near tourist attractions? 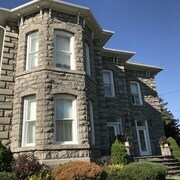 As there is only 1 hotel within a 0.1 kilometres (0.06 miles) of Morrisburg's downtown area, it makes good sense booking a place to stay well before your departure date. 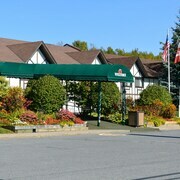 The The Clarkson Inn, New York, which is the nearest accommodation, is 30 kilometres (19 miles) from downtown Morrisburg. Also, you could check out the Brambles Inn & Gardens, located in New York, which is 30 kilometres (19 miles) away. 18 kilometres (11 miles) away from the center of Morrisburg, is the Quality Inn Massena. Alternatively, the Econo Lodge Massena can be found 14 kilometres (9 miles) away. 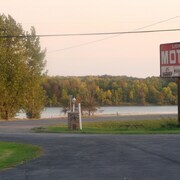 Another possibility is to book a bed at the Lion Motel or the Super 8 Massena NY. After you have spent time in Morrisburg, try and leave enough time to enjoy the other great attractions Ottawa - Southeastern Ontario has to offer. Ottawa - Southeastern Ontario is marked by forests, rivers, streams and lakes, and commonly visited Ottawa - Southeastern Ontario destinations include old towns, art museums and nature museums. In this section of Canada tourists might also try their hand at cross-country skiing and snow shoeing. Ottawa is 70 kilometres (44 miles) to the northwest of Morrisburg and is home to the Parliament Hill and National Gallery of Canada. The Hilton Lac-Leamy and Fairmont Chateau Laurier are some of the hotel and apartment alternatives in Ottawa. 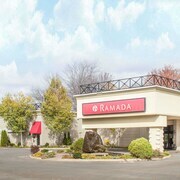 Alternatively, you could stay in West End, 70 kilometres (44 miles) to the northwest of Morrisburg, where you can choose from the Best Western Plus Ottawa/Kanata Hotel & Conference Centre and Stardust Motel. If you're staying in West End, be sure to check out the Funhaven Entertainment Centre and Maplelawn Garden. While you are here why not spend some time rubbing shoulders and cheering along with Ottawa - Southeastern Ontario sports fans at a local match. You'll find Canadian Tire Centre 75 kilometres (47 miles) to the northwest of Morrisburg. If you are keen on booking a bed nearby, make a reservation in the Holiday Inn Hotel & Suites Ottawa Kanata or Fairfield Inn & Suites by Marriott Ottawa Kanata. If you're flying to Morrisburg, the most practical airport is Massena International Airport. 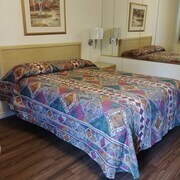 The nearest place to stay is Blue Spruce Motel. What are the most popular Morrisburg hotels? Are there hotels in other cities near Morrisburg? 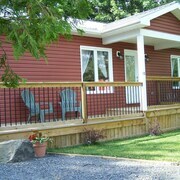 What other types of accommodations are available in Morrisburg? Explore Morrisburg with Expedia.ca’s Travel Guides to find the best flights, cars, holiday packages and more!